This Case History covers a system built for jet engine teardown and overhaul. The maintenance cleaning problems of a jet engine may be divided into two sections, namely, the “cold” part section and the “hot” part section. The “cold” section encompasses all of the parts and accessories ahead of the compressor where the temperatures are relatively low. As a rule, the oxide and carbon deposits and general soil on these components are not very tenacious. These deposits and any oil or grease can generally be cleaned by standard RAMCO agitating parts washers. The process objective is the removal of oils, grease and dirt from a variety of metal components. Each step incorporates a transport elevator to position and oscillate the parts within the different processing zones. The line runs left to right. The system consists of an immersion wash stage that can accept up to a 42″ long x 42″ wide basket with a gross weight of 500 pounds. 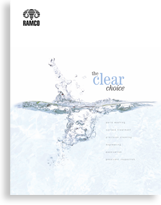 A key expertise at RAMCO is the ability to incorporating the distinctive features of the process into a system that yields optimum results. At the heart of each system is an NFPA Floating Cylinder used to transport and oscillate the process elevator(s). The process elevator(s) are the basic building blocks for each step in the process. 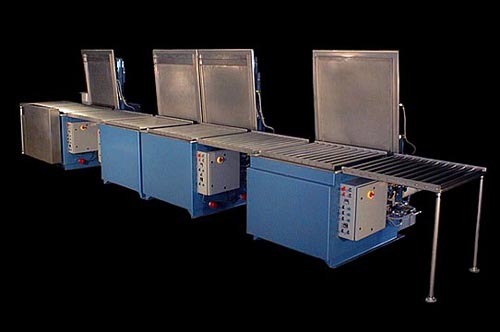 They are used to produce changing flow patterns when combined within other dynamic processing modes (in this case turbulation/agitation washing, agitation/cascading rinsing and hot-air-knife drying). The parts are dried in a very effective hot air knife/blow-off drying stage. All stages include digital cycle timers and temperature controllers. 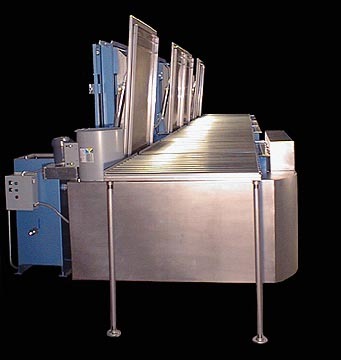 Platform roller conveyors are included on all stages to facilitate transfer. The system is built in accordance with Nema 12 electrical and NEC codes including the control panels, switches, pilot lights and lockout-tagout disconnect switches. The photo above shows a lip vent exhaust system installed onto the washing station. The large slotted stainless steel lip vent and plenum extends across the front of the processing chamber and terminates at the rear where it connects to a tubular axial fan. The ventilation is designed for 200 cfm per square foot of opening. Positive mechanical ventilation limits the accumulation and/or spreading of chemical vapors from the surface of the solution to the surrounding area thereby making the system safer and lessening any potential hazard to the immediate environment.